Okay, so I’m cheating. As some of you followers know, I traveled to Cuba last April/May. At that time, I published a map and some historical background on Cuba. I thought about just giving you a link to that post, but decided that there were enough new subscribers and people who would want to refresh their recollections to justify repeating it the way I originally wrote it. So here it is, unmodified. If you want to skip this and pick up with the next post, feel free. Otherwise, for starters, here’s a map. Notice a few things. If you never knew where Gitmo, much in the news, was, now you do, Southeast tip, almost as far as you can get from Havana. Jamaica and the Cayman Islands, both much smaller than Cuba (which is the largest island in the West Indies, about the size of Pennsylvania) are tucked to the South. 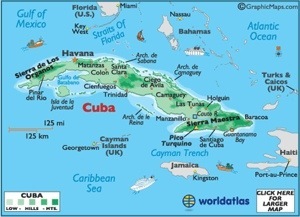 Although you can’t tell from this map, Cuba is 90 miles South of Florida. And, gee, Cuba has its own little group of islands, including Isla de la Juventud. Of Cuba’s 11 million people, 2.1 million live in Havana. And now, friends, a bit of (quite biased) history, edited very slightly by me, courtesy of infoplease. I apologize for the low brow source, but it’s really very convenient. Arawak (or Taino) Indians inhabiting Cuba when Columbus landed on the island in 1492 died from diseases brought by sailors and settlers. By 1511, Spaniards under Diego Velásquez had established settlements. Havana’s superb harbor made it a common transit point to and from Spain. In the early 1800s, Cuba’s sugarcane industry boomed, requiring massive numbers of black slaves. A simmering independence movement turned into open warfare from 1867 to 1878. Slavery was abolished in 1886. In 1895, the poet José Marti led the struggle that finally ended Spanish rule, thanks largely to U.S. intervention in 1898 after the sinking of the battleship Maine in Havana harbor. An 1899 treaty made Cuba an independent republic under U.S. protection. The U.S. occupation, which ended in 1902, suppressed yellow fever and brought large American investments. The 1901 Platt Amendment allowed the U.S. to intervene in Cuba’s affairs, which it did four times from 1906 to 1920. Cuba terminated the amendment in 1934. In 1956, Fidel Castro launched a revolution from his camp in the Sierra Maestra mountains. Castro’s brother Raul and Ernesto (Ché) Guevara, an Argentine physician, were his top lieutenants. The U.S. ended military aid to Cuba in 1958, and on New Year’s Day 1959, Batista fled into exile and Castro took over the government. The U.S. initially welcomed what looked like a democratic Cuba, but within a few months, Castro established military tribunals for political opponents and jailed hundreds. Castro disavowed Cuba’s 1952 military pact with the U.S., confiscated U.S. assets, and established Soviet-style collective farms. The U.S. broke relations with Cuba on Jan. 3, 1961, and Castro formalized his alliance with the Soviet Union. Thousands of Cubans fled the country. Russian aid, which had long supported Cuba’s failing economy, ended when Communism collapsed in eastern Europe in 1990. Cuba’s foreign trade also plummeted, producing a severe economic crisis. In 1993, Castro permitted limited private enterprise, allowed Cubans to possess convertible currencies, and encouraged foreign investment in its tourist industry. In March 1996, the U.S. tightened its embargo with the Helms-Burton Act. In early 2003, Castro sent nearly 80 dissidents to prison with long sentences, prompting an international condemnation of Cuba’s harsh supression of human rights. In July 2006, Castro—hospitalized because of an illness—temporarily turned over power to his brother Raúl and in Feb. 2008, the 81-year-old Fidel Castro ended 49 years of power when he announced his retirement. Raúl succeeded his brother. On April 19, 2011, Cuba made the most significant change to its leadership in over 50 years, by appointing José Ramón Machado to fill the second-highest position in the Communist Party. It was the first time since the 1959 revolution that someone other than the Castro brothers has been named to the position. In late 2011, buying and selling cars became legal, Cubans were allowed to go into business for themselves in a variety of approved jobs, from accounting to food vendors, real estate could be bought and sold for the first time since the days immediately following the revolution and the government pardoned more than 2,900 prisoners. I will start with new material in the next post.